The word “bot” is used in several ways. For the purpose of this post, we won’t be talking about our favorite bot—that, of course, would be the vacuuming Roomba robot that has forever rid us of the chore—or about Twitter Bots, the automated posters who masquerade as real users on the social media platform. Nor are we focusing on the many other internet bots that perform automated tasks like bidding on eBay, skewing Amazon product reviews, and so on. Chatbots are simply a computer program designed to emulate human speech and respond intelligently to written communication. Chatbots can be featured in-site, integrated into chat platforms like Facebook messenger, or contacted via SMS text message. They’re most commonly used for customer service or sales—but they can also revolutionize student services and streamline some admissions inquiries. Bots can be helpful throughout the student journey. Georgia State University uses a bot named Pounce to help admitted students through the tasks they need to complete before the fall, like applying for FAFSA student aid. In its first summer, Pounce responded to over 200,000 student texts and reduced “summer melt”—attrition of students who have been accepted but ultimately do not show up to campus in the fall—by 22%. Did that raise your eyebrows? It should. Deakin University in Victoria, Australia, meanwhile, uses bots to help smooth processes for current students. Its app, Genie, is powered by IBM’s famous artificial intelligence system, Watson. Genie can answer thousands of questions, and, by accessing data such as student’s locations and online textbook access, sends prompts and reminders. For example, if an exam is coming up and the student has yet to access their online curriculum, Genie will give a nudge—or if a student has been in the library for many straight hours, the app might suggest he or she take a break. Genie reduces the workload of campus offices by helping students manage tasks like enrolling for classes and paying for on-campus parking. 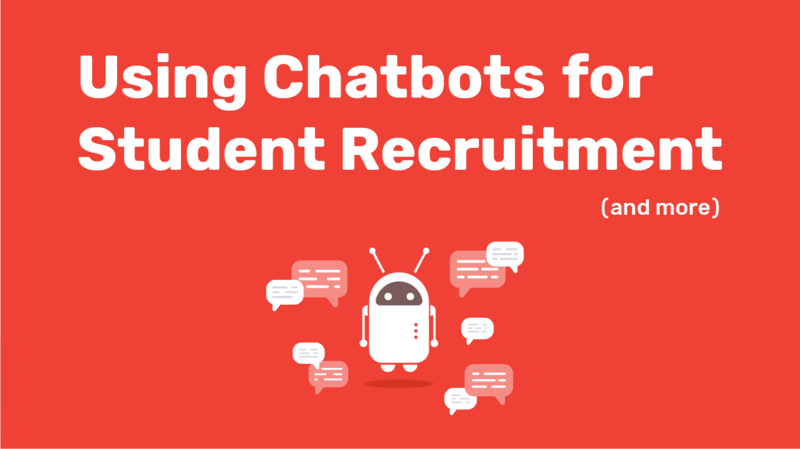 We haven’t yet seen universities making the most of bots specifically to nurture international prospective students (let us know if you have heard of a university who is doing so! ), but expect this trend to take off in the not-so-distant future. Why? Keep reading. Chatbots are easy for students to use—and, if done right, are genuinely helpful. Modern media consumers want to find the info and services they need quickly—and in an increasingly text-message-happy culture, they don’t want to have to pick up the phone to get their answers. This is particularly true of college-aged consumers, who are often loathe to pick up the phone to use as a phone, ever! It’s particularly true of students and parents in other countries and time zones. Chatbots are available any time of the day or night, and can be programmed in any language. Think about your prospective students and parents in China, for example—if they want an easy and quick response to a simple question (“what is yearly tuition for an engineering undergraduate?”) and cannot find the information on your website (because so many institutions bury this kind of commonly asked question...don't get us started), do you think they would rather work up the courage to call an institution they are just beginning to investigate, find a time during the narrow window when they are awake and your admissions staff are actually in the office, and (in the case of many parents) fight against a potential language barrier…or, would they simply prefer to shoot a message in Mandarin to a bot that is already there and ready to help? That's an easy one to answer. For universities, bots are a way to reduce costs (by lowering the burden on flesh-and-blood staff), increase responsiveness, and boost engagement. When built into a website (instead of used on a separate platform like Facebook Messenger), there is also a valuable opportunity to collect data. By monitoring the types of questions you receive most often, you are better able to spot the weaknesses in your online content or user experience. So why don’t we all have bots? Chatbots require set up and regular maintenance. Once your chatbot is up and running, it should be a labor and money saver. However, setting up a bot is a big task, and you will likely need a partner. Intead can help you find the right tech vendor; there are a number of interesting options out there. In the early going, bots need a babysitter to teach them how to behave. Creating usable and comprehensive ‘scripts’ for your bot to follow is critical. Your bot must be equipped with the information it needs to actually be helpful to students…or else using it will be more frustrating to your audience (and embarrassing to you) than having no bot at all. You’ll also have to pay attention to the branding, voice, and “personality” of your bot. You want students to get a warm and welcoming feeling from your bot, even if we all know that “he or she” is just a piece of friendly-sounding technology. The robot revolution is coming. In just a few years’ time, we expect you’ll be hearing a lot more about bots in higher ed. They will be helping prospective students learn about your institution and supporting the application process. Once they are enrolled, bots will be providing students with helpful study tips and then supporting their career planning and job search. An automated, networked and helpful study coach and career coach? Don't say we didn't warn you. So, back to our initial question: Will your institution be at the forefront? A fast follower? Or trying desperately to catch up? Start your research now. We can help.